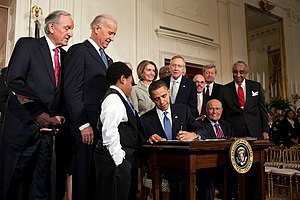 The Patient Protection and Affordable Care Act (PPACA), a.k.a. ObamaCare, looks even less logical to me today than it did around the time it was enacted. I realize my feelings aren’t likely to matter at this particular point in time, but it seems like every week there’s a new revelation that reinforces my original opinion: PPACA does more to support the status quo than the average Joe. After factoring in all of the premiums, taxes, fees, penalties, etc. that will be collected from individuals and businesses, and after all the graduated/phased elements take effect, PPACA will cost $256,000,000,000 ($256 billion) every year. Of the 45 million uninsured – and I am one – that were said to be the impetus for this plan, an estimated 30 million will remain uninsured. $256B works out to an average cost of $2,230 extra per U.S. household per year or $185 per month, on top of whatever each pays for health care/health insurance. That works out to $2,230 per household every year to insure just 4.7% of our population. How much in actual health care – not health insurance, which is loaded with administrative costs – could we buy for the same money? In general, the more direct one can be with assistance, the greater its impact and the less likelihood there is for waste, fraud or abuse to occur. Look at helping along a continuum from direct – e.g., bringing groceries or meals to a family dealing with an economic or health catastrophe – to indirect – money withheld from your pay and sent to the U.S.D.A.’s SNAP (food stamp) program. SNAP undoubtedly helps some people, but is rife with abuse that is hard to root out because the chain from contributor to recipient is impersonal and far removed. When I help my neighbor or a local organization, I know exactly who’ll receive my time or money and can see and feel good about what they do with it. My neighbor doesn’t have to go down to a government office and spill his or her guts to some bureaucrat about how much money they make, what they have in the bank, what are their prospects for work, etc., etc., and have that person pass judgement on whether they ought to be helped. If we really wanted to help more people have better health care, we would do it more directly. Unfortunately, because of government subsidization and the explosion of insurance company involvement, plus our preference for “Cadillac” coverage if we can get it, costs for both health care and health insurance have exploded and it’s hard to help someone with health care. I can’t pay for my neighbor’s doctor visit. Hell, some weeks I couldn’t go to the doctor myself. Personally, I think government should get the hell out of health care and health insurance. Completely. But if they were sincere in their desire for more Americans to have adequate health care, they would have gone the more direct route of expanding funding to places that actually provide care to low-income and uninsured people – instead of just funneling more money to insurance companies. Someone, somewhere, knew this when the bill was originally drafted, and it did include more funding for the direct provision of health care. Community health centers are very efficient at providing primary care and preventive care. Nationally, it costs $610 per year to provide comprehensive primary care to a patient in community health centers and $964 per year in other physician settings. This would save $354 per patient per year over the 10 million patients who now have to be seen by the private sector – that could have been a total savings of $3.54 billion per year. This doesn’t take into account the added savings of keeping people healthy and out of emergency departments and hospitals. To put this into perspective, the total federal base budget for community health centers was $2 billion per year before funding was cut by $600 million last year. States also cut funding by about another $200 million per year. So basically, we cut $800 million per year between the two and could have saved $3.54 billion per year? By suggesting money would be better spent at community health centers than in girding up the existing system as PPACA does, I do not mean to imply that it is okay to force people to pay for anyone else’s care. It’s not. I’m not in favor of extracting by force money to pay for anything, no matter how tragic the situation. Yes, even if I have leukemia or my child has diabetes. I’ll deal with it somehow, but it’s not my place to force you to shoulder my burdens, nor mine to carry yours unless I offer and you accept. I am just of the mind that if the government is going to take money from the American people and say it’s for health care, they ought to use it efficiently and actually provide health care. So, I’m puzzled over the avoidance of the seemingly obvious community health center route, and I can’t understand the rationale of the particular set of “solutions” we’ve been presented with under PPACA. Neither the math, nor the logic, works. I think they know PPACA is a train wreck of compromises and slimy back-room deals that’ll inevitably require fixes if/when repeal fails.